The Earth has five major gyres—the name given to the vast rotating systems of currents that churn through the oceans. The Pacific and Atlantic Oceans are moved by two major gyres each, while the last major gyre spirals through the Indian Ocean. Plastic and other artificial pollutants also accumulate in these gyres, making them key regions for environmental research. [pullquote]“Pollution throughout the oceans of the world is a problem that we all share,” says Nicole Trenholm[/pullquote] of the Ocean Research Project, a U.S.-based science data collection service. On April 27, Trenholm and project founder Matt Rutherford set out on a sample-gathering expedition from Oakland, California, traversing 12,000 kilometers of ocean on their way to Japan. Trenholm and Rutherford planned a route that would pass through parts of both the North and South Pacific gyre systems. While most ocean research expeditions spend just a few weeks in a specific gyre location, this would be the first continuous marine plastics survey from one continent to another. 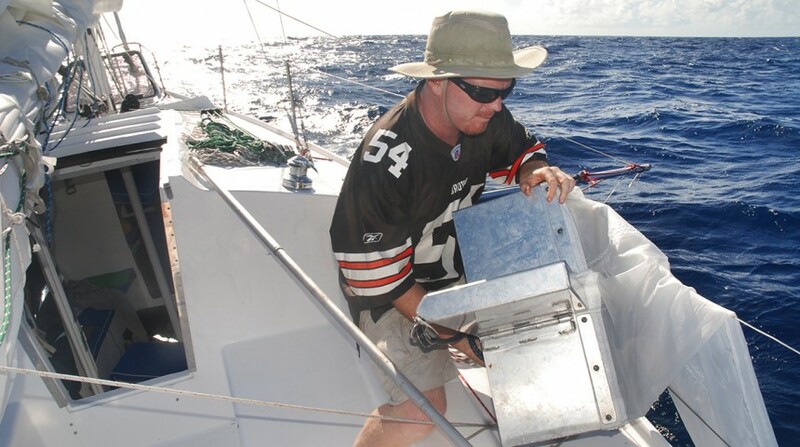 Trenholm served as principal marine scientist and offshore sailor; Rutherford, the captain, was recognized in the 2014 Guinness Book of World Records as the first person to complete a nonstop solo sailing voyage around North and South America. Samples were collected using a high-speed Avani net, a light aluminum frame with a cross-shaped opening that skimmed the surface of the water, capturing plastic particles greater than 0.44 millimeters in size. Trenholm stored each haul in a 500-milliliter sample bottle, adding isopropyl alcohol to preserve it for analysis at the Baltimore Underground Science Space and the University of Tokyo’s International Pellet Watch program. Baltimore research is to focus on estimating the prevalence and abundance of floating plastic in the Pacific gyres, as well as identifying the dominant types of plastic and bacterial DNA collected. The Tokyo samples will be analyzed for persistent organic pollutants such as PCBs and pesticides. Sakura arrived in Yokohama Bay in the middle of the night on June 27, 63 days after setting out. She slipped in ahead of a low-pressure system with unfavorable winds that would have made landfall difficult. Rutherford hadn’t slept in three days. The adventurers then climbed Mount Fuji and visited Osaka before departing by plane on July 18, leaving Sakura in the hands of the local W.D. Schock dealer. Their journey complete, they now await a freighter transporting their samples back across the ocean from which they were culled, with the next task—analysis—set to begin this fall.